The Kaiser Family Foundation’s newest tracking poll revealed that 42 percent of American women are taking action to combat what they perceive as an effort to limit access to reproductive health services. Nearly a third of women polled believe there is a “wide-scale effort to limit women’s reproductive health choices and services.” Forty-five percent believe that certain groups are attempting to curtail access to services, but it is not a wide-scale effort, while 7 percent believe no such effort exists. Recent controversies, including President Obama’s contraception coverage mandate and action taken by states and organizations to limit or extinguish funding to Planned Parenthood and its affiliates served as rallying cries for action for many women. 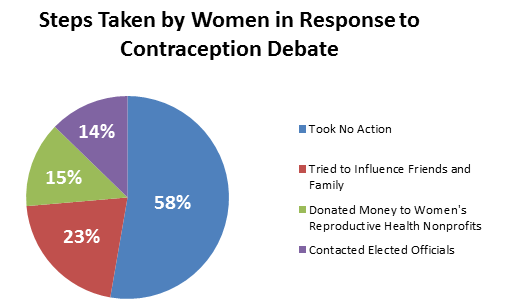 Twenty-three percent of women polled tried to influence their friends and family, 15 percent donated money to nonprofit organizations focused on women’s reproductive health, and 14 percent contacted elected officials.